Most of the Muslims left Mecca and settled in Yathrib, and the Quraysh felt that if Islam struck roots in their north, and became viable, it would pose a threat to their commercial interests in Syria. After some debate, they agreed, by consensus, to kill Muhammad himself while he was still in Mecca. They planned that one warrior from each clan of each tribe living in Mecca would be selected; all of them would attack the house of Muhammad simultaneously, and would kill him, just before dawn of the following day. The Banu Hashim, they felt, would be unable to fight against all the clans at the same time in retaliation for the murder of Muhammad. The Prophet Muhammad was apprised in time of this plan by a secret convert and so he called his devoted cousin, Ali ibn Abi Talib, disclosed to him the plan of the Quraysh, and his own plan to outwit them. His plan was to put Ali in his own bed, and then to slip out of the house at an opportune moment. He gave his cloak to Ali, bidding him lie down on the bed so that anyone looking in might think Muhammad lay there. He also asked Ali to restore all the deposits of the pagans to their owners, and then to leave Mecca and to meet him in Yathrib. The enemy surrounded Muhammad's house. They glanced inside and saw a recumbent figure covered in a blanket, and were satisfied that their "target" was within striking distance. Sometime after midnight, finding an opportune moment when the enemies were fast asleep, Muhammad escaped from his house. Ali slept in the bed of the Prophet all night. Just before daybreak, Muhammad's enemies stormed into the house with drawn sabers to kill the Prophet. But to their surprise and dismay they found that it was Ali and not Muhammad who was sleeping in the bed. They seized Ali for questioning but their leader told them that Muhammad could not have gone too far, and that they might still get him if they did not waste precious time in questioning Ali whereupon they released him. This event is well known in the history of Islam as Hijra or Migration. This was a situation fraught with the gravest danger. Ali also knew that Quraysh had resolved to kill the Apostle of Allah that night, and that to sleep in his bed was to sleep in the jaws of death. But when was Ali ever afraid of death? The conqueror of Khyber slept in the jaws of death so soundly as he had never slept in all his life. Being entrusted to restore the deposits of the Meccans to them, is proof that Ali was the confidante and the deputy of the Prophet of Islam even before the Migration to Yathrib. Because of Ali, he could leave in safety. 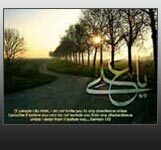 Hijra highlights Ali's unquestioning loyalty to Muhammad and his incredible courage. The enemy might have killed him either believing that he was Muhammad, or upon the discovery that he was not. He understood this perfectly and it was this devotion and courage that won for him the praises of the Holy Qur’an. Ali's role guaranteed the success of the Hijra (Migration) of Muhammad, and the success of Hijra alone made the birth of the political state of Medina possible. Allah made His slave, Ali ibn Abi Talib, the Instrument through which He put that Kingdom on this earth. Muhammad went to the house of Abu Bakr, and told him that Allah had ordered him to leave Mecca that same night. They immediately left the city, and went to a cave called Thaur in the south of Mecca. They were hiding in the cave when, a few hours later,enemies arrived in their pursuit. A spider had spun its web across the entrance to the cave, and a bird had laid an egg at it. Seeing the unboken web and intact egg, and thus convinced that the fugitives were not in the cave, the enemies gave up the pursuit and returned to Mecca. The Apostle and Abu Bakr spent three days in the cave. On the fourth day, Abdullah, the son of Abu Bakr, brought two camels with him for them and Abu Bakr offered the better one to the Apostle but he refused to accept it as a gift, and paid its price before riding it. He and Abu Bakr then mounted these camels and they rode toward Yathrib. They covered the distance between Mecca and Yathrib in nine days, and on the tenth day arrived in Quba, two miles south of Yathrib where they stayed in the house of Kulthum bin Hind, as his guests. Muhammad decided to wait for Ali before entering Yathrib. The Messenger of Allah arrived in Quba on Monday. On Thursday, Ali also arrived. He had returned the cash, the jewelery and other valuables of the Meccans to them. On the Friday, the Prophet rode from Quba towards Yathrib. The route was lined with merry multitudes of the Yathribites who were wearing their best holiday clothes. Women and children were singing songs of welcome from the rooftops of their houses. Every citizen of Yathrib was eager to host of the Prophet of Islam who was entering his city as a guest.But not wishing to disappoint even the humblest citizen, he dropped the reins of his she-camel, and declared that he would stay wherever she would halt. The she-camel ambled past many houses, and then halted in front of the house of Abu Ayyub, who became the proud host of the Apostle of Allah. Abu Ayyub belonged to the clan of Banu Najjar. Both Amina, the mother of Muhammad, and the mother of his grandfather, Abdul Muttalib, had belonged to this clan.